Pest wildlife not only cause damage to your home or business but also leave a big mess. Animals that enter through your attic leave waste deposits behind, including urine, feces, fur, body oils, nesting material, food and more. This can create an odor problem inside your home, causing unsanitary conditions or even a biohazard. Many animal droppings can cause human diseases such as Leptospirosis, Salmonellosis, Rickettsia virus, or even roundworm infection. Droppings can grow mold, leading to lung infections such as Histoplasmosis. This is particularly true with large accumulations of droppings from birds or bats. Mice may carry bacteria, viruses and other diseases. One such disease called Hantavirus is transmitted to humans through airborne particles, and symptoms are similar to those of the common flu.  Wild animals can also bring in parasites such as fleas, ticks, mites and more. When an animal leaves its scent in an attic, it can actually attract other wildlife. Big animals may try to break in if they smell the scent of mice, rats or rodents. Our company listings will remove the waste and apply a decontamination spray, or conduct a full insulation removal and replacement in cases where very heavy soilage is found. "Many animal droppings can cause human diseases such as Leptospirosis, Salmonellosis, Rickettsia virus, or even roundworm infection. Droppings can grow mold, leading to lung infections such as Histoplasmosis." Wildlife Pest Removal professionals will remove all of the animals from your home and seal off entry points, cleaning affected areas. Our professionals will remove all of the debris and the heavily soiled insulation, remove all of the large droppings by hand and vacuum up the small droppings. We will also spray the attic with an environmentally friendly biological cleaner that makes use of non-pathogenic bacteria and enzymes to break down and digest any and all organic and biological waste, and disintegrate it and render it inert. This eliminates the biohazard in your attic, destroys the smell, and eliminates the odors that can attract new animals to your home. Proper cleanup is a very important part of the wildlife control process, both for prevention and your health. There were bats in this barn. They created large piles of guano. 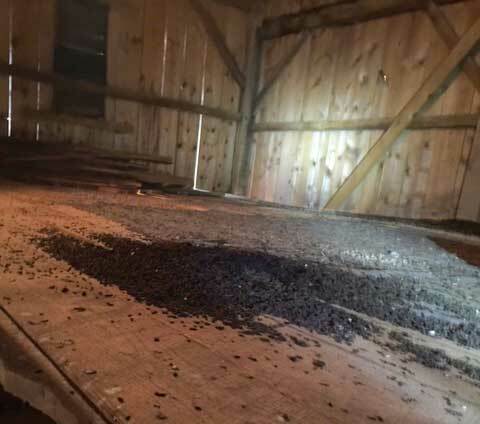 Besides making the barn smell bad, the guano could have given the owners a lung infection called histoplasmosis that is caused by inhaling the spores of a fungus that is carried in bat guano. Should You Remove Bat Guano? Removal is not risk free given the fact that there are probably bats in your home/attic or barn. Bats are the number one carrier of rabies in the United States and the risk of rabies is one of the biggest bat infestation dangers. Unlike Histoplasmosis, which is non-life-threatening for most people who contract the disease, rabies is a life-threatening disease that can be a serious hazard to your health. 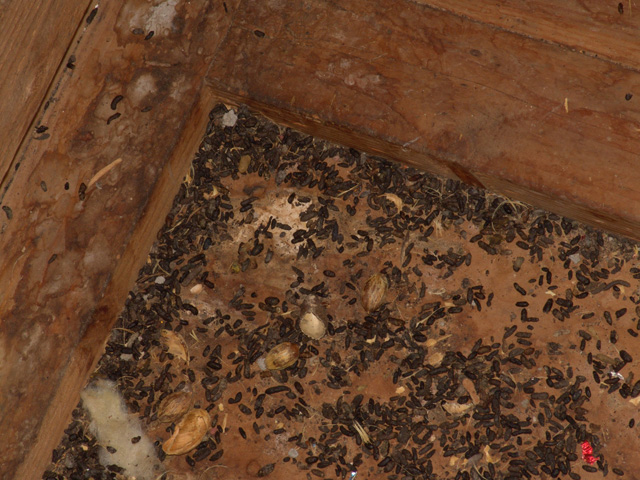 Bat droppings, or bat guano, is a serious health hazard and is one of the most predominant bat infestation dangers. Bat guano contains a fungus whose spores can cause an infection called Histoplasmosis. Most people contract Histoplasmosis by breathing in the spores from the fungus, but you can also become sick through coming into physical contact with bat guano. Histoplasmosis is an infection without visible symptoms, making it incredibly dangerous. Many people who contract Histoplasmosis don’t know they have it because they display no outward signs of illness. While for most people, the infection isn’t life threatening, it can do serious damage in people who have weaker or undeveloped immune systems, especially young children and the elderly. We suggest that you hire a professional given the risks. At Pest Wildlife Removal our professionals will thoroughly clean and disinfect any attic that we restore restore. You can be assured that our work is 100% guaranteed!